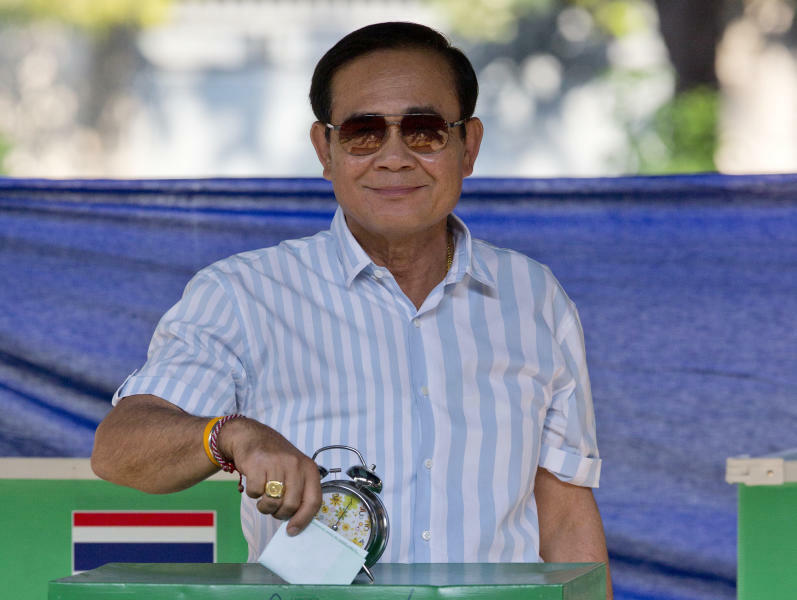 BANGKOK (AP) — A military-backed party has taken the lead in Thailand's first election since a 2014 coup, preliminary results showed, suggesting junta leader and Prime Minister Prayuth Chan-ocha could stay in power, helped by an electoral system tilted in the military's favor. With 93 percent of votes counted late Sunday, the Palang Pracharat party was first with nearly 7.6 million votes, according to the Election Commission. Its vote total falls short of the numbers needed for an outright majority in parliament. Pheu Thai, which was the governing party ousted by the coup, was next with 7.1 million votes. The country likely faces several weeks of bargaining among political parties before a potentially unstable coalition government is formed in May or June. 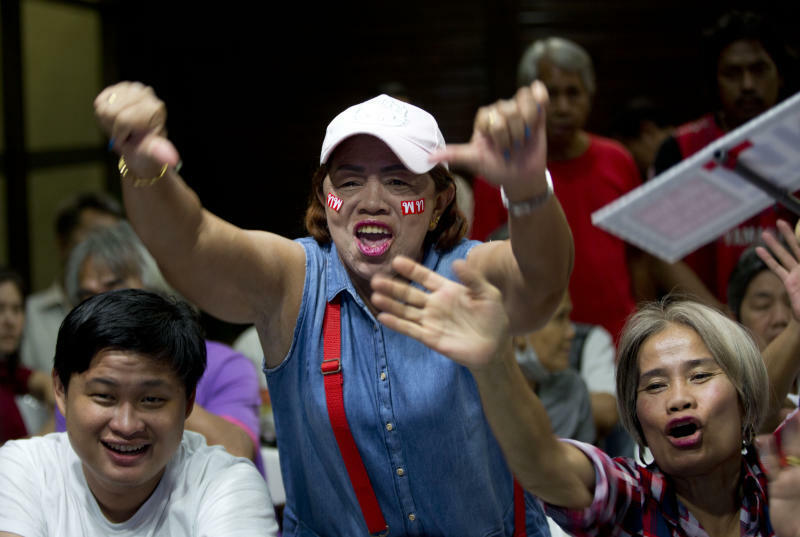 Thais voted for a 500-member parliament, which along with a 250-member junta-appointed Senate will decide the next prime minister. A new party, Future Forward, which was anti-junta and popular with young voters, scooped up 5.2 million votes. But voters deserted the Democrat Party, the country's oldest political party, in its Bangkok and southern strongholds. Its leader, former Prime Minister Abhisit Vejjajiva, resigned. Another party, Phumjai Thai, which experts say could support the junta, picked up 3.2 million votes. "It looks unlikely that a sizeable enough anti-junta majority will form in the House to put pressure on the military to back away," said Peter Mumford, an analyst at Eurasia Group, which advises international companies on political risks. That combined with the role of junta-appointed senators in helping to pick the next prime minister means Prayuth "remains in pole position for now," he said in a post-election analysis. "There will be uncertainty created by post-election coalition negotiations, potential recounts, disqualifications and constituency race reruns, and concerns over the legitimacy of the election," Mumford said. The election was the latest chapter in a nearly two-decade struggle pitching conservative forces including the military against the political machine of Thaksin Shinawatra, a tycoon who upended tradition-bound Thailand's politics with a populist political revolution. Thaksin was ousted as prime minister in a 2006 military coup and now lives in exile abroad to avoid a prison term, but parties allied with him have won every election since 2001. His sister, Yingluck Shinawatra, who led the Pheu Thai government that was ousted in 2014, also fled the country after what supporters said was a politically motivated prosecution. The blunt-speaking Prayuth, who as army chief led the 2014 coup, was hoping to extend his hold on power after engineering a new political system that aims to stifle the influence of big political parties not aligned with Palang Pracharat and the military. Nearly 6 percent of votes were disqualified, according to the Election Commission, which said it would provide an update on counting Monday. Pheu Thai's secretary general, Phumtham Wechayachai, said the party was waiting for official results but believes there were irregularities. The party wants to inspect disqualified and spoiled ballots, he said. "Even the reported numbers from the Election Commission and each media outlet are different. We have our own number too. The Election Commission report even paused for a while. It will be clearer once the official result is announced," Phumtham said. About 51 million Thais were eligible to vote. Leaders of political parties opposed to military rule urged a high turnout as the only way to derail Prayuth's plans, but the 66 percent turnout fell short of their hopes. A statement from Prayuth's office said he thanked people for voting and officials for holding the election in an orderly fashion. "What is now interesting is how Palang Pracharat can bring together a coalition," said Kevin Hewison, a Thai politics expert who is a University of North Carolina emeritus professor. "It looks like it needs at least two other parties but will probably cobble together more than that in the hope of creating a more stable government," he said. Thailand's powerful King Maha Vajiralongkorn had issued a statement on the eve of the election that said the role of leaders is to stop "bad people" from gaining power and causing chaos. It was also broadcast on Thai television stations minutes before voting started. Invoking a speech by his father, the revered monarch who died in 2016 after reigning for seven decades, Vajiralongkorn said not all citizens can be transformed into good people, so leaders must be given support in ruling to create a peaceful nation. It was the king's second notable intervention in politics recently. Last month, he demanded his sister Princess Ubolratana Mahidol withdraw as a prime ministerial candidate for a small Thaksin-allied party within 24 hours of her announcement. When it seized power in 2014, the military said it was to end political unrest that had periodically turned violent and disrupted daily life and the economy. The claim has been a selling point for Prayuth, who according to critics has overseen a period of growing inequality and economic hardship in Thailand. After the coup, political party gatherings were banned and pro-democracy activists and other dissenters were regularly arrested, interrogated and imprisoned. Just days before Sunday's election, Pheu Thai said the houses of party officials and its campaign canvassers in some provinces were searched by military personnel in an act of intimidation. Associated Press journalists Grant Peck, Kaweewit Kaewjinda and Preeyapa T. Khunsong contributed to this report.